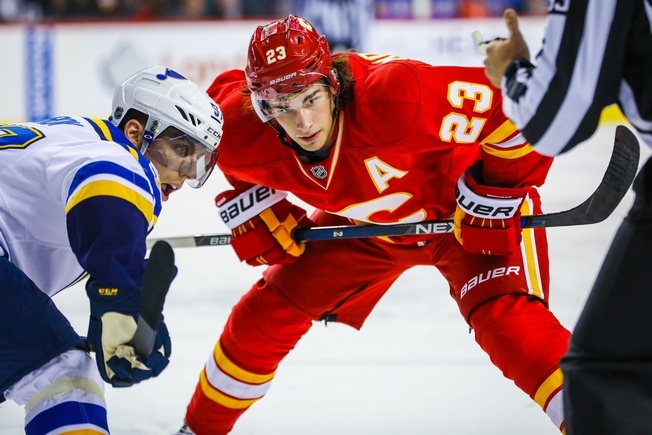 The Calgary Flames are struggling and Saturday night’s game against the St. Louis Blues dealt them another loss, with the Blues improving to 4-1-1 thanks to the 6-4 victory. But the real story for many has been the play of goalie Brian Elliott, who played second fiddle to Chad Johnson against his former team and really needs to start turning things around. The Flames netminder is 0-3-0 with a 4.72 goals against average and a .839 save percentage. He’s already allowed 14 goals against, which isn’t good. The Edmonton Oilers lit him up for 10 goals in two games, while Carolina was able to squeak four goals past the 31-year-old on October 20. Elliott is trying to take it all in stride, however, and that’s a good sign. The goalie posted the best save percentage in the league last season and many thought his arrival in Calgary would signal a sea change between the pipes that brought some much-needed stability to the position. Luckily, the story’s not over yet. Far from it. While it should provide at least a sliver of hope to have a vote of confidence from a former teammate, the proof still has to be in the pudding and Elliott will have to start turning things around on the ice. Of course, anyone who’s been watching the Flames as of late knows that their issues are legion. Johnson had to face a whopping 39 shots against the Blues on Saturday, for instance, while his club could only muster 27 against Allen. And Elliott has already faced 87 shots against in just three games, so the Flames could stand to tighten up in their own end. Maybe things will turn around soon and maybe Calgary will see a return to form for Elliott. Or maybe they’ll need a little more work. Regardless, the Flames face off against the Chicago Blackhawks on Monday. That’s as good a time to get the ball rolling as any.